Lower Mills Holiday Stroll 2010This evening – rain or moonshine – the third annual Lower Mills Holiday Stroll will continue to build on the success of the previous two years. In 2008 about 300 folks braved the drizzle, and last year participation jumped to between 400 and 500. 2010 promises to be even bigger with over 30 businesses in Lower Mills and Milton Village open from 5:30 to 8 p.m., offering samples, demonstrations, special discounts, and/or displays of work by local artists. 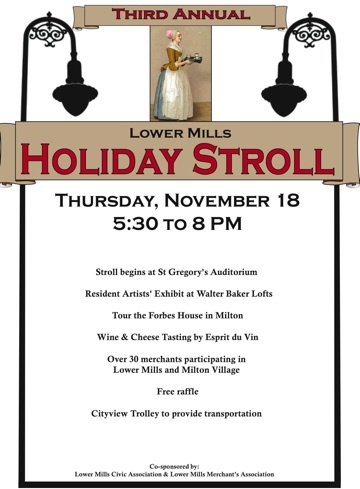 Though primarily a business booster co-sponsored by the Lower Mills Civic Association and Lower Mill Merchants Association, the Stroll is packed with pop-up arts events and family friendly entertainment. These organizations hope to stimulate holiday sales with bargains, freebies, musical interludes, surprises, even free trolley service to shuttle shoppers too weary to “stroll” across the bridge between Dorchester and Milton. The event is organized by Lynda Watson, owner of Streamline Antiques, a boutique specializing in Art Deco, 50’s kitsch and 60’s funk. She was inspired not so much by posh holiday strolls like the ones on Nantucket and Beacon Hill, but by the Jamaica Plain First Thursdays art shows throughout the Center Street business district. Dot Avenue should look its festive best with red and gold balloons bobbing outside participating establishments, and greenery and ribbons festooning the lampposts courtesy of Cedar Grove Gardens. Each site will participate in a unique way. At Streamline, Watson will be selling one-of-a-kind Christmas stockings pieced together by Dot artist Jacqueline Harris from vintage fabric, linen, lace, old buttons and jewelry. The Ice Creamsmith will again dish out samples of whatever flavor visitors choose—including their November specials: Pumpkin, Peppermint and Eggnog. Nearby Standish Village fortifies visitors with cider and pie. Several sites will be featuring music, ranging from the Crusaders Senior Corps brass band to a barbershop quartet at—where else?—Aidan’s Barber Shop, which will be bringing back the South Shore Men of Harmony. Probably the wisest place to start is St. Gregory’s, where one can park for free at the CVS lot across the street at 2235 Dot Avenue and where the trolley starts. In the church auditorium, families can get maps for the evening while they enjoy the sounds of a steel band, sample food from local eateries, receive a free tote bag, and score free raffle tickets for prizes like an Ipad and gift certificates. Kids can have their pictures taken with Santa either at St. Greg’s or –new this year– a tent in the parking lot of 1205 Adams sponsored by the Medical Area Federal Credit Union. The Walter Baker Artists’ Lofts (1231 Adams Street) will feature live music and exhibits of works by residents and other artists. Strollers can have their picture taken as La Belle Chocolatier, the famous Walter Baker Chocolate trademark, posing behind a life-size reproduction of the iconic painting and poking their face through the cut-out space. Across the Neponset, the Forbes House Museum will be hosting open house, and Esprit Du Vin, a wine and cheese tasting. Several businesses at the Adams Building (60 Adams Street) will participate along with some Central Avenue businesses, including Cakes Bakery, GKR Residential, Sullivan Insurance, and Mackie’s Barber Shop. Hot chocolate will be available along the stroll route. For more details, call 617-980-1191 or visit lowermillsmerchants.com.